The Boxing Truth®: Examining The Potential Options For Saul Alvarez At 154lbs. And 160lbs. Examining The Potential Options For Saul Alvarez At 154lbs. And 160lbs. The fight between former WBC Jr. Middleweight world champion Saul Alvarez and Jr. Middleweight contender James Kirkland had all the ingredients on paper of an action-packed fight. Although sometimes an actual fight may not always produce an all action battle that it might appear would be the case prior to the fight, this bout more than lived up to its anticipation when Alvarez and Kirkland met on May 9th at Minute Maid Park in Houston, Texas. This fight can best be described as simply a “Shootout.” From the opening bell the two fighters engaged in a toe to toe battle. Although Kirkland was initially the more aggressive of the two fighters, it was Alvarez who would drop Kirkland with a flush straight right hand in the first round. Kirkland was able to survive the round and continued to battle with Alvarez. Although Kirkland showed his mettle and was very “Game” he did not have an answer to avoid Alvarez’ well-balanced attack to the body and head. Despite taking significant punishment, Kirkland continued to press forward and attempted to turn the fight in his favor. Alvarez however, would have other plans. The “Shootout at Minute Maid Park” would come to a sudden and brutal conclusion in round three. Alvarez would drop Kirkland for the second time with a right uppercut. As was the case in the first round, Kirkland was able to get up from the second knockdown. Alvarez however, would close the show seconds later dropping Kirkland for a third and final time with a right hand to the chin sending Kirkland down on his back on the canvas. The bout was immediately stopped by Referee Jon Schorle at 2:19 of round three. This fight simply lived up to every expectation and gave the over thirty thousand fans in attendance their money’s worth in what will likely be a fight of the year candidate. As this observer stated prior to this fight, this was an important fight for both fighters, which could have an impact on who may get an opportunity to fight for a vacated world title down the line following Floyd Mayweather’s recent announcement that he is relinquishing the world titles he currently holds in both the Welterweight and Jr. Middleweight divisions. This will open a gap in each division as Mayweather currently holds the WBC and WBA world titles in the Jr. Middleweight division, as well as the WBC, WBA, and WBO titles in the Welterweight division. What this might mean for Saul Alvarez, who is rated number one and number two respectively in the WBC and WBA Jr. Middleweight ratings is he might be in position to fight for either title in his next fight. Although it is unclear as of this writing as to what the WBC or WBA plan to mandate to fill the vacancy of each title, one might assume that a potential rematch could be ordered by the WBA between Alvarez and Erislandy Lara, who currently holds interim/regular champion status in the WBA’s Jr. Middleweight ratings. Lara however, is scheduled to face Jr. Middleweight contender Delvin Rodriguez on June 12th. Whether or not Lara and Rodriguez will be fighting for a vacated WBA Jr. Middleweight world championship remains to be seen. One could assume however, that the winner could be mandated to face Alvarez in their next fight. There are also other possibilities for Saul Alvarez outside of the 154lb. Jr. Middleweight division. Following his victory over Kirkland, Alvarez expressed interest in possibly moving up in weight to the 160lb. Middleweight division to face either current WBC champion Miguel Cotto or undefeated unified WBA/IBO champion Gennady Golovkin. A fight between Alvarez against either Cotto or Golovkin would likely be extremely lucrative for all involved and a significant pay-per-view draw. 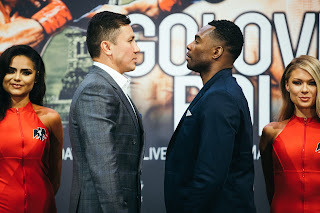 Both Golovkin and Cotto however, have business to attend to as Golovkin will make the fourteenth defense of his world title this weekend against top contender Willie Monroe Jr. Cotto meanwhile will make the first defense of his WBC world title against former two-time Middleweight world champion Daniel Geale on June 6th. If Golovkin, Cotto, and Lara are all successful in their upcoming bouts it could open up some interesting possibilities for Alvarez over the next year as all three could be and perhaps should be future opponents. One thing however, is definitely clear. Saul Alvarez is a legitimate star in the sport of Boxing and no matter who he fights next it will likely be a hot ticket.